The Filioque controversy probably has to do with the Latin phrase which when translated as `and the Son’, was added to the Nicene Creed by the Western churches and opposed by the Eastern churches. The Nicene Creed was then confirmed by the First Council of Constantinople in 381 and with the “filioque” was accepted by the Western churches after the Synod of Toledo in Spain in 589:- “We believe in the Holy Spirit, the Lord and the Giver of Life, who proceeds from the Father, who with the Father and the Son is worshipped and glorified”. 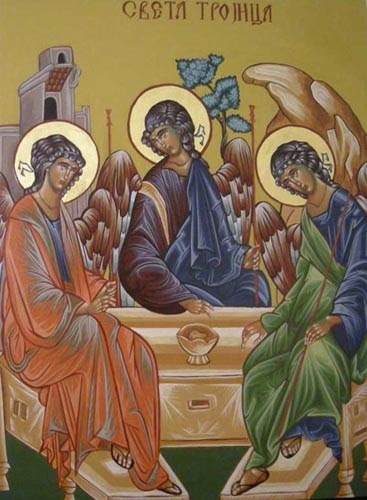 This extract refers to the doctrine of the procession of the Holy Spirit from the Father and the Son. It was opposed by Photius, the patriarch of Constantinople in 867 and 879 and was not accepted on two reasons namely, i) the addition was made unilaterally, changing a creed which was approved by early ecumenical councils and ii) the formula reflected a particular western conception of the Trinity which was objected by most of the Byzantine theologians. 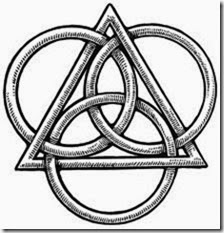 This theological dispute between the two churches in the West and East was a bit subtle when it came to dealing with the Godhead persons and the mystery of the Trinity and it became a continuous friction between them which resulted in an official cause of the Great Schism in 1054 AD. Photius had excluded not only `and the Son’, but also `through the Son’, relating to the procession of the Holy Spirit and `through the Son’, was applicable to the temporal mission of the Holy Spirit. 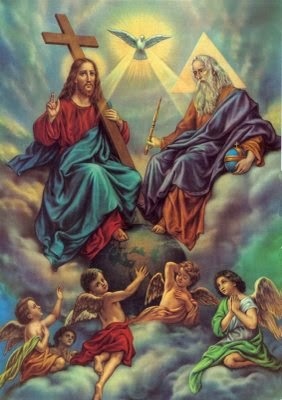 According to him, the eternal procession of the Holy Spirit is `from the Father alone’. The Orthodox theologians believe that the phrase was only a reaffirmation of traditional teaching while on the other hand; Sergei Bulgakoy declared that Photius’s doctrine represented a novelty for the Eastern Church. Pontius has been recognized as a saint by the Eastern Orthodox Church and his criticism has made reconciliation between the East and the West a difficult task and the two churches are still in disagreement over the issue of Filioque controversy. Scripture reading in John 14:26 tells us that `the Counselor, the Holy Spirit, whom the Father will send in my name’ and in John 15:26 `When the Counselor comes, whom I will send to you from the Father, the Spirit of truth who goes out from the Father, He will testify about me’, indicates that the Spirit is sent out by the Father and the Son. The concern in the filioque clause is to protect the presence of the Holy Spirit and the Bible in Acts 5:3-4 states that the Holy Spirit is God. Those opposing the filioque clause object since they believe that the Holy Spirit proceeding from the Father and the Son is the Holy Spirit who is `Subservient’, to the Father as well as the Son. Those upholding this controversy believe that the Holy Spirit proceeding from the Father and the Son do not believe that the Spirit is equal to God with the Father and the Son. The filioque was probably devised in response to Arianism who denied the divinity of the Holy Spirit. Unsuccessful attempt was made to bring about an understanding between the two points of view by the Council of Ferrara- Florence in1439 but the eastern and the Western churches remain separate and the doctrine of filioque remains as one of the most primary point of difference between these two churches. The doctrine of filioque controversy relates to the presence of God’s person which itself is a divine mystery, incomprehensible to man since God being infinite and immortal is most incomprehensible to us, mortal beings. The Holy Spirit is God, sent by God as Jesus Christ’s representative here on earth when He ascended into Heaven after His Resurrection from his death on the Cross. Presently many Eastern Orthodox bishops are overlooking their old prejudices and are acknowledging that there is no need for separation on the issue of the filioque controversy. Bishop Kallistos Ware who had opposed the filioque doctrine remarks that the filioque controversy which separated the two churches for many centuries is a mere technical issue with a solution. According to him the problem was more in the area of semantics and different emphases than in any basic doctrine differences. Towards 1014, the German King Henry II who came to Rome to be crowned Emperor was amazed at the different custom present there and requested Pope Benedict VIII who owned King Henry his restoration to the papal throne after the seizure of Antipope Gregory VI, had the Creed with the addition of the Filioque which was sung during Mass in Rome for the first time and in other places the filioque was incorporated in the Creed later. The Filioque clause since then has been included in the Creed throughout the Latin Rite but not where Greek liturgy is used though it was never adopted by Eastern Catholic churches. 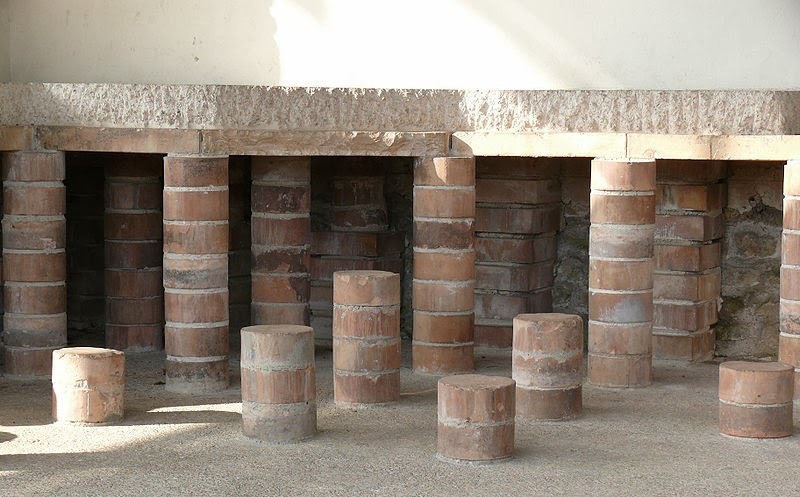 Hypocaust, one of the ancient forms of heating system in underground heating with hot air, originated with the Romans, 2000 years ago and was both a primary as well as secondary system for houses and building for both public and private purpose. Hypocaust is derived from the Greek work `hypo’ meaning `under’ and `caust’ meaning `burnt’. 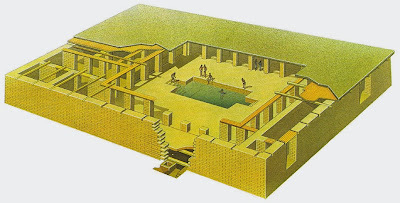 The main use of hypocaust was found in large bath houses and sauna rooms were made by adding water as a pool which was heated by fire and also the air below. The floor was raised above ground level by pillars, or columns or pedestals of stone, called pile stack which had layer of tiles, followed by layer of concrete to top the tile. A furnace with continuous burning fire created heat which then flowed through the space below the raised floor, providing heat to the floor and the rest of the room and once cooled the air escaped through flues in the wall and through vents in the roof. Since the furnace area needed to be spacious, it was usually located in a separate area of the room and the flues were constructed in a way that it did not utilize any extra space. This enabled the heating without polluting the interior of the room. Ceramic box tiles were also placed inside the walls in order to remove the hot burned air as well as to heat the walls and where rooms in need of more heat, were placed closer to the furnace. This heat could be increased on adding more wood to the fuel. This involved a lot of labor and constant attention was needed to keep the fire burning as well as expensive. The purpose of the hypocaust was to heat the room evenly. 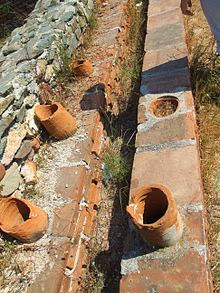 Similar to the water system, the air flow system was also connected by ducts comprising of brick or stone tunnels built underground towards large open space beneath raised floor ending into wall flues. These flues were provided with insulation for the room and the hot air rising created a barrier thereby retaining the warmth inside the building. One of the main disadvantages of the hypocaust was that it seemed dangerous when the fumes created by the furnace in the form of carbon monoxide crept out of the spaces below the false floor and in the main space and though this is detectable and preventable today, in those days, the Romans had no knowledge about the same. Another disadvantage was that with this system, there could have been the possibility of a fire break out which could be unmanageable and out of control. While the concrete or stone construction could have withstood the fire, the occupants would be in danger. This system seemed to be useful in ancient times but keeping in mind the safety codes, it is impossible to install them in modern times since the hypocaust system in high probability would be causing the occupant discomfort resulting in falling ill or even the possibility of dying from carbon dioxide or poisoning. Control on the hypocaust system is not user controlled due to the fact of the heat coming off from an open flame and for this reason; there are two setting for this system of on and off. Few of the Toraja people follow the ancestral animist belief which has three levels. The sky being the upper level which is ruled by the supreme god Puang Matua, creator of the people, plants and animals, while the land is the intermediary level and the underground, the place of the spirits, death and darkness. Their funeral ceremony takes place nine days after the first ceremony or later or even after several months in order to raise necessary funds for the funeral ceremony. The dead in the meanwhile are placed inside the house and the body is not placed in the tomb resulting in his soul searching for its way. When the funeral rites are restarted and the dead is put in a coffin, it must not touch the ground and hence it is carried on a hearse similar to a Toraja house through fields and rice paddies amidst sound of gong in the vast field of Ma’Palolo. The ceremony takes place in the day called `towards the tomb’, and the dead leave the field where the coffin located on the hearse is carried on the shoulders of the men. This being the last journey, the procession is accompanied by singing, reaching the funeral promenade which is a large rock in which the sepulcher of the families are carved and ascend is through large ladder made of tall bamboo stem with notches. Thereafter the people return home and thirty days later, the relative renounce to the mourning clothes. But in the ancient past it was believed that the dead should be buried not at the place of their death but in the village of origin and since these villages were at distant places and isolated, it became difficult for family members to carry the dead all the way to these distant villages. The possibility of seeking help from people was sought to make the dead man to walk back to the village where they were born. It was some sort of a mobile service for the dead making a stiff, motionless being to walk straight ahead without any expression and it was said that if anyone would address the corpse directly, it would collapse and be unable to continue the journey. 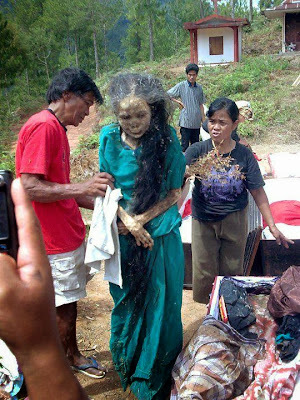 These ceremonies were conducted in Tana Toraja Regency of South Sulawesi Island, in Indonesia where the deceased who had died away from the place of birth were temporarily revived (though the method of revival is unknown) in order to make them walk back to their birthplace to be laid to rest with proper respect. 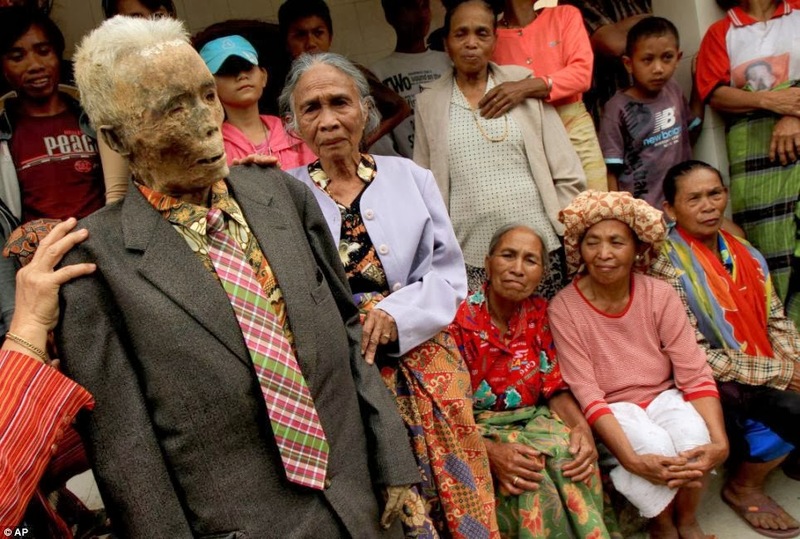 The Toraja society has an intriguing story regarding their rituals of death and the afterlife. It is believed to have come from Tibet where the dead are relocated from their tomb to replace their clothing each year. When the Tana Toraja people die, they are often kept in boxes which are then placed in tombs carved out of solid rock high up on the cliff and are not buried in the ground. With due respect to the dead and their afterlife, the boxes are removed from the tombs every few years and the body are cleaned and redressed. If the boxes are damaged they are replaced or fixed. Their funeral ceremonies being so extensive, it is also expensive and hence funds need to be raised for the same. 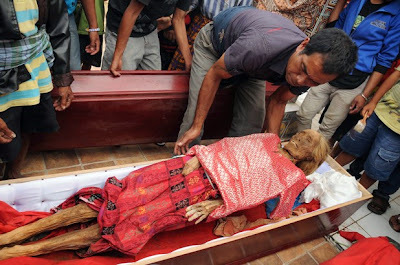 The people of Toraja believe that death is a long process and at times takes years as the deceased gradually work their way towards Puya – the afterlife and hence the dead are placed in temporary coffin during which time the family accumulate the required funds for a proper funeral. When the funds are raised the Toraja believe that the dead are able to walk to their new burial site. Corpse walking is part of their tradition and the body is held in a standing position to stimulate ambulation. The body follows guided by black magic expert which takes it to the funeral site. It is believed that as a rule, if the corpse is called by name, the body falls and will not rise again. Hence those accompanying the dead during the procession would warn people they met, not to talk directly to the dead. The procession path was also chosen through quiet paths where the chances of meeting strangers seem less. According to their belief, the spirit of the dead person should return to their village of origin where it was necessary to meet his relatives who can guide them on their final journey into the afterlife after the completion of the ceremony. Earlier, the people were frightened to travel far in case they would die while they were away and then would find it difficult to return to their village. Nowadays the practice of walking the dead to their place of origin has reduced and this practice is slowly declining. 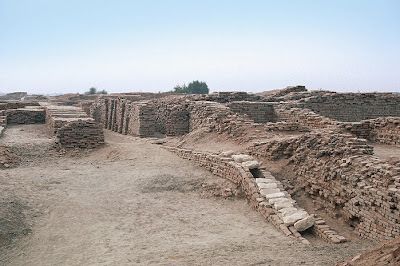 An archeological site in the province of Sindh, in Pakistan, known as Mound of Dead – Mohenjo-Daro was built around 2600 BCE and was one of the largest settlements of the ancient Indus Valley Civilization. It is also one of the world’s earliest major urban settlements which was abandoned in the 19th century and only rediscovered towards 1922. Several excavations have been conducted at the site and was designated a UNESCO World Heritage site in 1980. 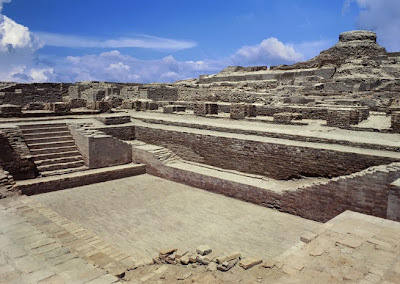 Where town planning was concerned, the people of the Indus Valley civilization had achieved some amazing standards and each city when planned at the peak of the civilization housed around 40,000 people. A technologically as well as sophisticated advanced urban culture is portrayed in the Indus Valley civilization and the quality of municipal planning indicates knowledge of urban planning and efficient municipal governments with high focus on hygiene. The streets of major cities were constructed in a perfect grid pattern which could be compared to the present times of New York and the houses were secluded from noise, thieves and odor. A typical city was divided into two sections with each separately fortified where one section was located on an artificially raised mound known as the acropolis and the other was on ground level. It was the acropolis which contained the important buildings of the city such as the assembly halls, granaries, religious structures and the famous Great Bath of Mohenjo-Daro. The amazing construction of the Great Bath had the entire structure of about 179 feet long and 107 feet wide with the complex having a large quadrangle in the middle with galleries and rooms all around it. At the centre of the quadrangle was a large swimming enclosure of around 39 feet long with 23 feet wide and 8 feet deep with steps to a brick lined pool where the entire complex was connected to a water supply and sewer system. This Great Bath area was well built with layer of natural tar to keep away leakage and was presumed to be used for ritualistic or religious purposes It also featured a large well and central market place with a building having an underground furnace possibly for heated bathing. It was a well fortified city lacking actual city walls though it had towers to the west of the main settlement and defensive fortification towards the south. Another special feature of this city was the large granary which had an impressive structure running 150 feet long, with 75 feet wide and 15 feet high which gave an astounding space of 168,750 cubic feet. This was divided into 27 compartments in three rows and was well ventilated making it possible to fill in grain from outside and its large sized space probably indicated a highly developed agricultural civilization. The town plan was regular and the lower section of the city housed the inhabitants and here amazing features have been discovered. The city having broad roads around 30 meters long were well connected which met at right angle. The fire baked bricks were uniform in shape and size while the regularity of construction and plan indicated a government that was well organized and with bureaucratic capacity. The houses were built with standardized baked bricks with many spacious courtyards while some of the bigger houses had multiple stories with paved floors. Another amazing fact is that almost every house had its own wells, bathrooms and drains with each house directly connected to an underground sewer system which ran throughout the city. This urban plan had the world’s first urban sanitation systems and within the city, the individual homes or groups had provision of water from wells which appeared to be set aside for bathing and the waste water was directed to covered drains which were lined along the major streets while houses only opened to inner courtyards and smaller lanes. Moreover the houses were constructed on plinth which rose above the ground level accompanied with stairs which were at the wall towards the front door having flat roofs and looked identical. The planning was done in a way so as to avoid any type of hindrance on the road with each detail well planned. The Indus Valley Civilization inhabitants thus enjoyed to some extent an excellent sanitary convenience as well as highly developed municipal life and the fact is that this civilization existed almost five hundred years ago. Mohenjo-Daro had amazing construction considering its antiquity with its planned layout based on grid of streets laid out in a perfect pattern. At its height the city accommodated around 35,000 inhabitants and the buildings of this city was particularly far advanced with structures of same sized sun dried bricks of baked mud and burnt wood. Towards 1900 BCE, gradual decline began and people started to leave the city. The people who remained were probably poorly nourished and by 1800 BC most of the cities were abandoned. According to Sir Mortimer Wheeler, he proposed that the decline of the Indus Valley Civilization was caused by the invasion of an Indo European tribe from Central Asia and as evidence, he provided a group of 37 skeletons found in various parts of Mohenjo-Daro as well as passages found in the Vedas with reference to battles and forts though some rejected his theory. However this civilization did not disappear all of a sudden and many elements of the Indus Civilization are found in later cultures. Mohenjo-Daro was destroyed and rebuilt at least seven times and each time a new city was built, it was rebuilt on top of the old ones. The flooding of the Indus probably led to believe the cause of destruction. The town planning of this city has amazed the archaeologist all over the world and excavations are being carried out till date leaving an everlasting effect on the people of today. This city has become a specimen of a wonderful town planning in the present world and has also inspired many. It is amazing to believe that in the ancient past civilization, people could think scientifically and were conscious in building a dream city which was well planned and well executed. While the umbrella is a simple tool created by man, it's been very useful since it was first created to shield humans from the sun and rain. The umbrella is thought to have been invented over 4,000 years ago. While no one knows the person who originally came up with the idea the first time, evidence of them has been found in Assyria, Egypt, Greece, and China. At first they were simple devices meant to shield people from the sun. This would change, however, when the Chinese waterproofed them to also protect from rain. The first umbrellas were really simple, but also large and bulky. Compared to the collapsible umbrellas of today, the ancient ones were hard to handle and reserved for the very rich - people who had money to create them and also money to pay people to hold them. This would change over the years, however, as technology improved and new methods of making umbrellas were used. One of the first recorded uses of an umbrella was by Wang Mang in 21 A.D. when he had one created for one of his carriages. The umbrella was actually collapsible, which made it very high-tech for the time period. While the contraption was written about in the history books of the time, an actual example was found in the tomb of Wang Mang. This is probably one of the earlier umbrellas of all time. This wasn't the actual first umbrella in use, however. In fact, some writings have the technology going back 2,400 years or more. Over the years, the Chinese and other Asian cultures were able to improve the initial designs to come up with the collapsible umbrella we know and love today. This is a good thing because now people are able to stay dry without having to worry about staying indoors all the time! The first store dedicated to nothing but umbrellas was James Smith and Sons which first opened in 1830 in London, England. Somewhat surprisingly, the shop is still there today! The umbrellas sold in the shop were crude by today's standards. They used whale bones and waterproof canvas. In 1852, the first umbrella with metal ribs was created by Samuel Fox. It wouldn't be until a hundred years later in the mid 20th century that the modern collapsible umbrella that's compact in size was invented. Since that time not a lot of improvements have been made. When you consider all the changes over the last 4,000+ years however, this simple invention is rather spectacular. If you have any personal stories about umbrellas, please leave a comment below and let us know - especially if they are funny stories. While this article has given you a little peek into the history of the umbrella, there's definitely a lot more to learn about this invention that keeps on helping humanity - one rainstorm at a time. Ben knows a lot about gutter mesh because he's been working in home construction for some time now. When not working on houses, he likes to write guest posts to publish online.